One particularly obsessive man recently followed me round with a camera, whipped up online hysteria against me and eventually had to accept a police caution for harassment. As I’ve blogged previously, the background to this claim was Tim Ireland’s invited presence to film a hustings event in Flitwick in 2010. Dorries complained to the police, and Tim subsequently spoke with the police at length voluntarily to explain the situation. Because Tim spoke to the police formally, the interview took place “under caution”. This meant that Tim’s statements could be regarded as evidence. However, there was no “police caution”, which would mean that police have judged a criminal infraction to have taken place. Dorries has elsewhere been more careful to use the “under caution” phrase, but in the above she is clearly misleading the public about the outcome of a police investigation. 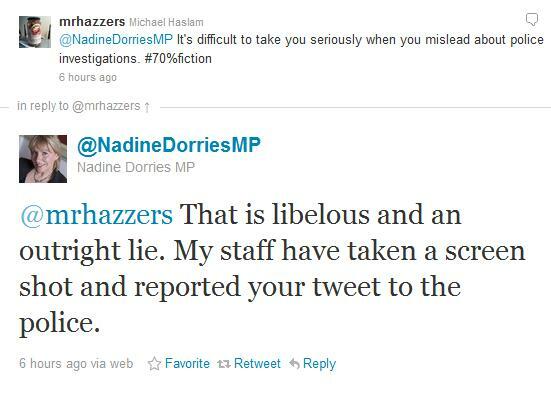 @nadinedorriesmp @mrhazzers That is libelous and an outright lie. My staff have taken a screen shot and reported your tweet to the police. Mrhazzer’s “70%fiction” hashtag, of course, refers to Dorries’ infamous admission that her blog was “70 per cent fiction” after details published on her site put some of her expenses into question. Her complaint against mrhazzers is nonsense: Dorries certainly misled the public about the police and Tim Ireland, and it’s not libellous to say so. And it’s certainly not a police matter either way. – Mrs Humphrey Cushion: “Mrs Cushion” is a constituent who has criticised Dorries on Twitter and on her blog. Last year, she was on sick leave from her carer job awaiting operations on her feet for arthritis – Dorries (helped by Paul Staines) tried to smear her as a benefits cheat, and Dorries’ bogus harassment complaint led to a visit from the police. Again, no further action was taken, but the police visit frightened her children, and it took place while she was in pain and lying in bed recuperating from the operations. – Chris Paul: Paul is a Labour blogger whom Dorries accused of hanging “around outside” her house due to “sexual” interest. In fact, there was no evidence of either. – Linda Jack: Jack had the temerity to stand against Dorries for the Liberal Democrats in the 2010 General Election, and Dorries accused her of being part of a “group” opposed to her.